As published by US-CERT, the Federal Trade Commission (FTC) has reported (again) spoofed e-mail messages appearing to be from the FTC and containing malicious code in the attachment. Think about it, do you really expect an email from the FTC? That being the case, why would you open it? "The spoof email includes a phony sender's address, making it appear the email is from "frauddep@ftc.gov" and also spoofs the return-path and reply-to fields to hide the email's true origin. While the email includes the FTC seal, it has grammatical errors, misspellings, and incorrect syntax." Webroot Spy Sweeper Is "Out of Favor"
It started earlier this month when an image of the Spy Sweeper installer was posted at the SunbeltBLOG showing the Ask Toolbar and Search Assistant pre-checked as an opt-in. The comments ensued. Anyone who is familiar with the security forums has most likely seen the sections of the forums with update information on the various anti-virus, anti-malware, firewalls and other security software programs posted in those forums. This is done not for the vendors but rather to provide information to visitors of the sites about reputable software available for their use. Information is provided on both pay and free software programs, generally including a brief descripton of the software and a link to the product information and/or download site. In addition, as the software is updated, information on the latest signature files is provided. As you can imagine, maintaining this information takes a lot of work. There is a "crew" of dedicated individuals who maintain the updates for a number of sites. There is no remuneration by the software vendors to these dedicated people. However, many sites have discontinued providing update information for Webroot Spy Sweeper. Some removed the software from the public view while other sites have discontinued posting updates at this time. Although there are others, examples are here, here, here, here, here, and here. Caution: Spysweeper now bundles the Ask Toolbar and is selected by default! Note: SpySweeper has problems with a large HOSTS file"
"Due to the default (pre-checked) opt-in of the Ask Toolbar and Search Assistant, it has been determined that this site will no longer provide update information for Webroot Spy Sweeper software." Even if you are not considering Windows Home Server at this time, you will enjoy touring the Windows Home Server House with video stories of real people using Windows Home Server. Click the image to visit the Windows Home Server House! Updated to add the link to Blake Handler's collection at The Road to Know Where. Bill Sisk reported in The Microsoft Security Response Center (MSRC) blog that Security Advisory 943521 has been updated after they became aware of publicly disclosed exploit code being used in limited attacks on customers. "Third party applications are currently being used as the vector for attack and customers who have applied the security updates available from these vendors are currently protected. However, because the vulnerability mentioned in this advisory is in the Microsoft Windows ShellExecute function, these third party updates do not resolve the vulnerability – they just close an attack vector." The reported attacks are limited, however, the normal warning applies regarding the not opening unsolicited attachments in emails, regardless of the sender. The additional caution of not visiting untrusted websites applies equally. "Windows Update (WU) started altering files on users' systems without displaying any dialog box to request permission. The only files that have been reportedly altered to date are nine small executables on XP and nine on Vista that are used by WU itself. Microsoft is patching these files silently, even if auto-updates have been disabled on a particular PC." There has been a series of articles on numerous sites about mysterious changes to user Automatic Update settings, many of which are shown below as references. The most likely explanation to the changes in the AU settings is explained by Scott Dunn as attributable to Windows OneCare. "Like most features, the intention is to protect users from changes made by malicious programs. As a side however, it will also detect if Microsoft or one of their applications decide to change these settings without your knowledge. Also included in this new version will be detection of a few other unique settings like the prefix inserted by your browser (http://). If you don’t include http:// when you type in an address, Windows automatically adds it. If I changed this setting to http://www.billp.com/ no matter what you typed into your browser you’d always come to me. Depending on what comes after it, I could display a fake look-alike phishing page and grab your eBay, or Paypal account number." As a devoted WinPatrol fan, I installed the update, launched the Security Center and selected "Turn Automatic Updating on or off". As you can see from the screen copy below, WinPatrol notified me that a change was detected in Windows Auto Updates (AU), providing the opportunity to prevent the change or restore the previous settings. For a change intentionally being made to AU, tell Scotty "No" and WinPatrol will leave your changes untouched. However, if some unknown force attempts to change the settings without your permission, merely click "Yes" to give Scotty permission to restore the original settings. There is so much more that WinPatrol can do to monitor your computer. The WinPatrol update today is frosting on the cake. 27Oct07 Edit Note: Updated to add Windows Live OneCare Team Blog link. Changes have been made to the SIR, including new sections and a new look and feel. One statistic I found interesting is that 65% less "potentially unwanted software" and 60% less malware has been found on Windows Vista machines than Windows XP SP2. The day has finally arrived -- the kids have their own computer for school work, your spouse has a new laptop and you have a remodeled home office. As a result, you are ready to set up a home network. The problem is that you have no idea where to begin, let alone what is needed and how to make sure it is secure. A device that sends, or routes, information between two networks (for example, between a home network and the Internet). Routers find the quickest paths for sending information, which makes network connections faster. Routers can be wired or wireless. A small picture that represents a file, folder, program, or other object or function. A high-speed Internet connection. Broadband connections are typically 256 kilobytes per second (KBps) or faster. Broadband includes DSL and cable modem service. A networking standard that uses cables to provide network access. Ethernet is the most widely installed technology for connecting computers. A device that connects your computer to a network. Sometimes called a network interface card (NIC). A set of rules, called network protocols, that computers use to exchange information over the Internet and over home and business networks. TCP/IP includes standards for how computers communicate and conventions for connecting networks. A device that allows computer information to be transmitted and received over a telephone line or through broadband services such as cable or DSL. Modems are most commonly used to connect to the Internet. A group of computers or other devices, such as printers and scanners, that communicate either wirelessly or by using a physical connection, such as an Ethernet cable or a phone line. A type of high-speed Internet connection using standard telephone wires. This is also referred to as a broadband connection. A Microsoft Windows technology that allows computers on a network to access online services through a single Internet connection. A company that provides Internet access to individuals or companies. An ISP provides a telephone number, a user name, a password, and other connection information so that users can access the Internet through the ISP's computers. An ISP typically charges a monthly or hourly connection fee. While you're at Vista 4 Beginners, you may also want to learn How to setup a Bluetooth connection. There is so much to learn, I suggest taking it one step at a time. Read all the instructions first, assemble the parts, read the instructions again and start slowly. If in doubt, read the instructions again. Good luck! Added Joel Hruska's "The ABCs of securing your wireless network"as well as the earlier published Wireless Security Blackpaper. From Vista4Beginners are newly published tutorials on How to share a printer with other computers from your network, and How to install a network printer. Daylight-saving Time Ends Soon. Is your PC updated? In March, we all dealt with the first onslaught of changes resulting from the new law enacted in 2005, resulting in daylight saving time starting and ending on a different cycle in both the United States and Canada. In addition to companies using custom scheduling, time calculation or billing applications that are date dependent, this change impacted international companies that interact with servers in North America. Of course we all know the effect daylight saving changes have on our sleep. At least when November 4 rolls around in the U.S. and Canada, we will get back that hour of sleep we lost in March. We have a lot of clocks in our house that I have to adjust but, what about the computer time? Since I use Automatic Updates, my computer is properly patched for the time change. To confirm that your computer is updated, visit the Daylight Saving Time Help and Support Center. 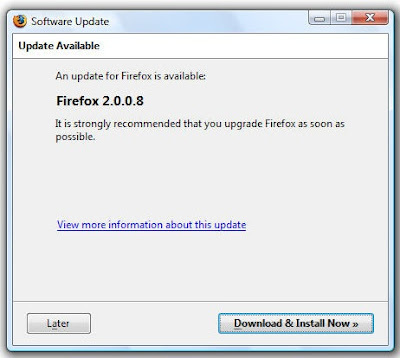 Mozilla released a security update for Firefox, including MFSA 2007-35 and MFSA 2007-29 which are identified as critical. Since it is that simple, go ahead and update now. During the past summer I shared memories of a trip to visit family in Minnesota. For me, the ease of picture taking and sharing was both simplified as well as enhanced after I purchased a Kodak EASYSHARE V610 Dual Lens Digital Camera. Little did I know at the time that the first digital camera was actually invented 32 years ago. In fact, at the time, I doubt Steve Sasson thought that the innovation that led to U.S. Patent 4,131,919 would be the beginning of the evolution of Eastman Kodak Company to the digital age. It is difficult to imagine the evolution from the first prototype, pictured at the left, to the powerful digital cameras available today. Amar Bose, founder and chairman of Bose Corp. The German team of Karlheinz Brandenberg, Dieter Seitzer and Heinz Gerhauser, who developed the MP3 format. Steve has continued in an innovative role at Kodak, including, for example, involvement in the development of Kodak EasyShare thermal printer docks and thermal printing. Earlier this year, Steve received the "Visionary" award from the Photographic Manufacturers and Distributors Association (PMDA). As a member of the Legal Division at Kodak, Steven continues his involvement in the intellectual property arena. "The camera described in this report represents a first attempt demonstrating a photographic system which may, with improvements in technology, substantially impact the way pictures will be taken in the future." But in reality, we had no idea ..."
Perhaps "no idea", but vision and imagination. Congratulations! The people avidly watching the countdown to Windows Vista most likely remember the "Live Clock" gadget that so many bloggers and webmasters displayed on their sites. I had one in the sidebar here at Security Garden and enjoyed watching the days get closer to the official release of Windows Vista. As posted in the Windows Experience Blog today, the creator of the "Live Clock" has an Office Tips & Tricks gadget that provides a different tip every day on the Microsoft Office system. I haven't seen a lot of gadgets that I feel worthwhile cluttering the sidebar with, but this is one I definitely plan on giving a try. It is available from LiveGadgets, and added to the Customizing Vista bookmarks. 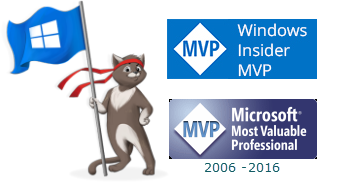 Adding Congratulations for the MVP Award to the developer! On 10 October 2007 Microsoft revised security bulletin MS07-056 - Security Update for Outlook Express and Windows Mail (941202) to add Windows XP Professional x64 Edition to the "Affected Software" section. Important Note: This change only affects the bulletin text and does not affect the security update itself. No update files or detection logic were changed. Customers who have already installed this update will not need to reapply it. When initially published, existing detection and deployment tools (EST, MBSA 2.0.1, SMS 2.0 with EST and SMS 2003) correctly offered this package for Windows XP Professional x64 Edition. Within the bulletin the following additional changes were made: 1) Known Issues set to none 2) Corrected missing file information to the bulletin text for Outlook Express 6.0 Service Pack 1 on Windows 2000 Service pack 4 and Outlook Express 5.5 Service Pack 2 on Windows 2000 Service pack 4. This alert is to notify you that Microsoft has released Security Advisory 943521 – URL Handling Vulnerability in Windows XP and Windows Server 2003 with Windows Internet Explorer 7 Could Allow Remote Code Execution - on 10 October 2007. Microsoft is investigating public reports of a remote code execution vulnerability in supported editions of Windows XP and Windows Server 2003 with Windows Internet Explorer 7 installed. This vulnerability does not affect Windows Vista or any supported editions of Windows where Internet Explorer 7 is not installed. We are not aware of attacks that try to use the reported vulnerability or of customer impact at this time. Review Microsoft Security Advisory 943521 for an overview of the issue, details on affected components, mitigating factors, suggested actions, frequently asked questions (FAQ) and links to additional resources. Customers in the U.S. and Canada who believe they are affected can receive technical support from Microsoft Product Support Services (http://support.microsoft.com/security) at 1-866-PCSAFETY. There is no charge for support calls that are associated with security updates. International customers can receive support from their local Microsoft subsidiaries. There is no charge for support that is associated with security updates. For more information about how to contact Microsoft for support issues, visit the International Support Web site (http://support.microsoft.com/common/international.aspx). Upon completion of this investigation, Microsoft will take the appropriate action to protect our customers, which may include providing a solution through a service pack, our monthly security update release process, or an out-of-cycle security update, depending on customer needs. MS07-055 addresses a vulnerability in Kodak Image Viewer, and is rated as a Critical bulletin. MS07-056 addresses a vulnerability Outlook Express and Windows Mail, and is rated as a Critical bulletin for earlier versions of Windows and as an Important bulletin for Windows Vista. MS07-057 is a Cumulative Security Update for Internet Explorer, and is rated as a Critical bulletin. MS07-058 addresses a vulnerability in RPC, and is rated as an Important bulletin. MS07-059 addresses a vulnerability in Windows SharePoint Services 3.0 and Office SharePoint Server 2007, and is rated as an Important bulletin. MS07-060 addresses a vulnerability in Microsoft Word, and is rated as a Critical bulletin for earlier versions and as an Important bulletin for more recent versions. In addition to the bulletins mentioned above, Microsoft also re-released bulletin MS05-004. This re-release updates detection includes Server 2003 Service Pack 2 and Vista as affected platforms. There were no changes to the update binaries, so if you have already successfully installed this update, you do not need to reinstall it. Customers who have applied MS07-040 are unaffected by this detection update, as their systems are up-to-date from a .NET Framework security stance. Please refer to the bulletin revision history for more information. Matouse released the latest leak-test results today. Once again Jetico Personal Firewall 2.0.0.35 stays on top of the list with an Excellent rating. Jetico offers a free version of their firewall for personal use as well as a pay version. In addition, Jetico Personal Firewall provides support for Windows Vista, Windows Vista x64 edition, Windows Server 2003, Windows Server 2003 x64 edition, Windows XP, Windows XP x64 edition and Windows 2000. Help is available at Smokey's Security Forum in the Official Jetico Inc. Personal Firewall Support Forums. Jetico Personal Firewall 2.0.0.35 stays on its Excellent 9375 points. Kaspersky Internet Security 7.0.0.125 scores 8475 points, which is 100 points more than its previously tested version, a Very good result. Norton Internet Security 2008 15.0.0.60 still catches no leak-tests on its default settings, but it has a better protection on its highest security settings. Its new score is 3600 points, which is still a Very poor result, but better than 3100 points of its previous version. Online Armor Personal Firewall 2.1.0.11 made a big improvement. This version does not use user mode hooks to bypass leak-testing techniques any more and it also implements a new protection against some techniques that it did not cover before. The new version scores 9375 points, an Excellent anti-leak protection. PC Tools Firewall Plus 3.0.0.36 is also an improved version with better anti-leak protection than its previous version. However, this version of PC Tools implements a lot of user mode hooks to fight some leak-tests and thus its protection is easy to bypass. Its score is 5825 points, a Poor anti-leak protection, but still much better than 2625 points of its older version. Finally, ZoneAlarm Pro 7.0.408.000 is on its own with the same result as previously tested version, which means 8600 points and a Very good anti-leak protection. Hat Tip, ren, Moderator @Smokey's. Microsoft KB Article 941600 is a cumulative update package addressing the issues described below that have affected USB components in Windows Vista. KB 930568 - Error message when you try to put a Windows Vista-based computer to sleep or into hibernation: "STOP 0x000000FE BUGCODE_USB_DRIVER"
KB 934796 - Error message on a Windows Vista-based computer that is running a USB composite device: "STOP 0x000000FE"
"Because Microsoft takes its commitment to help protect the entire Windows ecosystem seriously, we’re updating the IE7 installation experience to make it available as broadly as possible to all Windows users. With today’s “Installation and Availability Update,” Internet Explorer 7 installation will no longer require Windows Genuine Advantage validation and will be available to all Windows XP users. If you are not already running IE7, you can get it now from the Internet Explorer home page on Microsoft.com, get a customized version from a third-party site, or, if you haven’t already received it via Automatic Updates, this version will be delivered to you as we described previously. If you are already running IE7, you will not be offered IE7 again by Automatic Updates. We’ve included a new MSI installer that simplifies deployment for IT administrators in enterprises. Learn more about it here. Actually, I think this bears repeating: "Internet Explorer 7 installation will no longer require Windows Genuine Advantage validation and will be available to all Windows XP users." With this change, even if you do not have WGA installed, there is no excuse now for Windows XP users not upgrade to IE7. Do it today to take advantage not only of the additional security features, but the other major improvements to Internet Explorer. Before installing IE7, please see the instructions for Preparing for and Installing IE7. Detection: Microsoft Baseline Security Analyzer can detect whether your computer system requires this update. Restart Requirement: The update will require a restart. Detection: Microsoft Baseline Security Analyzer and Enterprise Update Scan Tool can detect whether your computer system requires this update. Restart Requirement: The update will not require a restart, except in certain situations and for Windows Vista. Detection: Microsoft Baseline Security Analyzer can detect whether your computer system requires this update. Detection: Microsoft Baseline Security Analyzer can detect whether your computer system requires this update. Restart Requirement: The update will not require a restart. Detection: Microsoft Baseline Security Analyzer can detect whether your computer system requires this update. Restart Requirement: The update may require a restart. Microsoft Windows Malicious Software Removal Tool: Microsoft will release an updated version of the Microsoft Windows Malicious Software Removal Tool on Windows Update, Microsoft Update, Windows Server Update Services and the Download Center. At this time no additional information on these bulletins such as details regarding severity or details regarding the vulnerability will be made available until the bulletins are published on Tuesday. In tracking down the Google cache for Jeff Davis' Favicon blog post, I also found his old writeup on pop-ups. Since the information is still useful, I have rescued it from the Google cache and copied it here for preservation. I get a lot of e-mails from Internet Explorer users asking why they still get pop-ups even though they have turned on the Pop-up Blocker. Barring user error, there are three possible reasons discussed below. Note: I will discuss several Pop-up Blocker settings. These settings can be accessed from Tools->Pop-up Blocker->Pop-up Blocker Settings. Reason: You clicked (or otherwise initiated a user action) on the page and your Pop-up Blocker Filter Level is set to Medium. Discussion: When we wrote the specification for the Pop-up Blocker feature, one of our primary goals was to allow pop-up windows that were legitimately useful to the user. The only piece of information we have by default is "did the user click something which ultimately was the cause of this attempted pop-up?" This works great most of the time: bank sites, stock trade sites, merchandise ordering sites, etc. It also gives the bad guys an opportunity if they can trick you into visiting their site and then into clicking on something. To mitigate this we did two things: 1) we limit the number of pop-up windows that can be opened as the result of any given user initiated action to one, and 2) we added the High setting. When you set your Filter Level to High, we block all new windows, even those that result from user actions. Solution: Set your Filter Level to High; make use of the Allow List and the override key (CTRL) to allow desired pop-ups. Reason: You have spyware or other malware installed, either with or without your knowledge. Discussion: There are a huge number of software packages which, once installed, drive revenue to their creators by constantly spawning pop-up windows. Sometimes they are installed on your computer by exploiting known security holes, sometimes they come hidden in other software packages that (may or may not) perform other useful functions. If you experience an avalanche of pop-ups, especially if you have not even launched Internet Explorer yet, then this is probably your issue. If you are simply experiencing the occasional one-off pop-up while browsing the web, then one of the other reasons is the likely culprit. Solution: Acquire and use reputable anti-spyware software. Microsoft has a Beta version of Windows Defender available for download here. A few minutes spent researching on the web should lead you to several other popular packages as well. Keep your computer up-to-date with regard to the latest security patches by visiting Microsoft Update on a regular basis and enabling automatic downloads of security patches. Reason: The web site is making use of a Pop-up Blocker unaware Active X control that provides a mechanism for opening a new Internet Explorer window. Discussion: Active X controls, when you get right down to it, are just COM objects running in the Internet Explorer process. They can do anything that any other program running on your computer can do. Any control installed on your computer, even ones that come pre-installed before you get your computer home, can be instantiated and run by any website. If the control exposes a method that opens a new Internet Explorer window, then malicious web sites can use it to open unwanted pop-ups. For application and web site compatibility reasons we cannot intercept and block these; the control must opt-in to Pop-up management. We are working with other teams and providers to patch these as they are brought to our attention. Furthermore, do not install Active X controls from sites you do not trust 100%. As illustrated by the rose in the address bar for Security Garden, a favicon is a small image associated with a website. The rose I use is a miniature version of the rose avatar I use in the help forums. I have had Jeff Davis' mini-FAQ on Favicons in IE7 saved in my RSS feed for many months. As I attempted to go to the source today, I discovered that in May Jeff Davis left Microsoft to pursue other opportunities. As a result, links to http://blogs.msdn.com/jeffdav/ returns "Defunct Blog". Having retrieved the mini-FAQ from the Google cache, it is copy/pasted below for preservation purposes. why doesn't the favicon for my site appear in IE7? Today I have a mini-FAQ on Favicons. Q: How do I make a favicon appear for my site in IE7? A: There are two ways. The first is to put a file in the root of your domain called favicon.ico. The second is to use a <link> tag with the rel="shortcut icon" value and the href value set to the URL for the Icon you wish to display. Q: How often does IE download the favicon? A: IE will download the icon when a user first visits the site. The icon is stored in the Temporary Internet Files folder on the client machine. Additional metadata about the favicon is stored in the user's Url History database. If either store is cleared, or items relating to the favicon have naturally expired, then the icon will be downloaded again on the next visit. If more than one page (or site) shares the same favicon, it is only downloaded once. IE takes great pains to download the icon as few times as possible to reduce load on the server. Q: I see the wrong favicon for some sites I visit. How do I fix this? A: If the history database has become corrupted in some way, this can happen. The simplest solution is just to use Delete Browsing History (on the Tools menu) to clear the cache and the history store. Q: I put a favicon.ico on my site as you described, but it still doesn't appear. A: It must actually be a .ico (an Icon) file. Bitmaps, pngs, gifs, etc, will not work. IE7 will download your favicon to the Temporary Internet Files folder and call ExtractIcon() on the file. If this fails, we will show the default icon instead of your favicon. Q: I verified that my favicon really is an icon, but it still doesn't appear. A: Since IE loads your icon out of the Temporary Internet Files folder, it must be able to actually store it there. If you are setting the no-cache directive for the icon file, then IE will not be able to display your icon and will display the default icon instead. You can use Fiddler to verify. Q: How do I create a different favicon for every page on my site? A: Put a different tag on each page, pointing to a different icon. Q: I changed my site's favicon to a different icon, but the old one still shows in IE. How do I force IE to update? A: If you just put the favicon.ico file in the root of your domain, IE doesn't have any way of knowing if it changed. To force an update, you need to use a tag and point to a different filename than you previously used. The current filename is compared against the known filename stored in the Url History database. When IE sees the filename has changed, it will download your new icon. Alternatively, you can ask your users to clear their history and cache (Tools->Internet Options->Delete Browsing History), which will also force IE to download the new file. That should cover most of the questions I've received about favicons in IE7. If you have more questions, feel free to ask. Updated on Monday, 5th March to fix a spelling error and add some additional questions. Author: "jeffdav" Tags: "internet explorer, favicons"
Active members of the security community as well as those who frequent such forums for education and help most likely vividly recall the DDoS (Distributed Denial of Service) attack on Castle Cops in February. Most times, the perpetrators escape unscathed, but not always! Read about the arrest of the alleged perpetrator in Robin Laudanski's report at Castle Cops: Botmasters Take Heed – You Are Being Put On Notice.